Learn Gentry’s advanced Black Hops style combo, Ballistic. The trick starts from a triple or nothing. Makes it a lot easier if you put your thumbs in the string. Pop the yoyo straight up into the air and drop the string off your opposite index finger. Then cross your opposite hand under your yoyo hand and land the yoyo on the front string. Next pinch the string on your opposite hand with your middle finger. 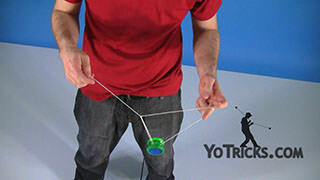 Then you are going to pop the yoyo straight up into the air and drop the string off the first finger on your yoyo hand. Uncross and recross your hands. This time with your yoyo hand under your opposite hand, the string will transfer onto your middle finger on your opposite hand and you will land on the first string. 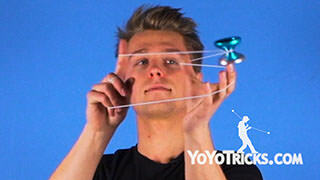 This time pop the yoyo off the string and drop the string off your middle finger on your opposite hand. Uncross and recross once again, landing on the front string with your opposite hand under your yoyo hand. Next, you are going to pop the yoyo up again. Uncross and cross your hands, this time with your yoyo hand underneath. Then you are just going to reverse that motion and put yourself back into the same mount that you were just in. You will notice that this is the same mount that is in the trick Kwyjibo. 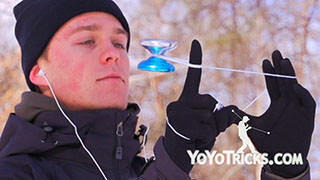 Then you are just going to flip the yoyo over, just like in Kwyjibo. Pop the yoyo up once again. 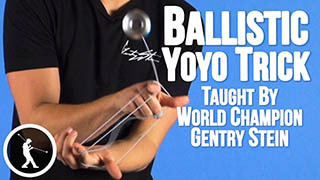 Uncross and cross your hands with your yoyo hand on top this time, landing on the front string on your index finger. After that you are going to pop the yoyo up, uncross and cross your hands, leaving you in a green triangle. 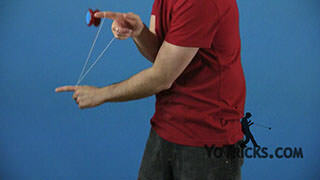 To break down how that works, you are going to pop the yoyo up, drop the string off your index finger on your yoyo hand. This will leave you in a position that looks like this. What you are going to do next is push your opposite hand forward, leading with your thumb. This will open up this top string for you to land on easier. Then you are going to cross your yoyo hand under your opposite hand and land on that string that is touching both your index fingers. As you can see, that is going to leave you in the green triangle. 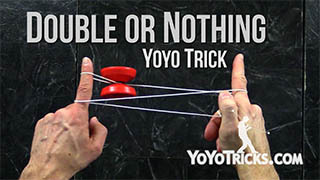 For the last part of this trick, you are going to pop the yoyo up one more time. Cross your arms and land in a cross armed trapeze. To break this down, you are going to pop out of the green triangle. But first make sure that you bring your opposite elbow forward. This will give you some space to pop to the inside of the green triangle, also between both your arms. Once you pop out, you are going to cross your arms laterally instead of vertically this time. This will set you up to land in that cross armed trapeze, which will also end the trick for the bind. And that is Ballistic.